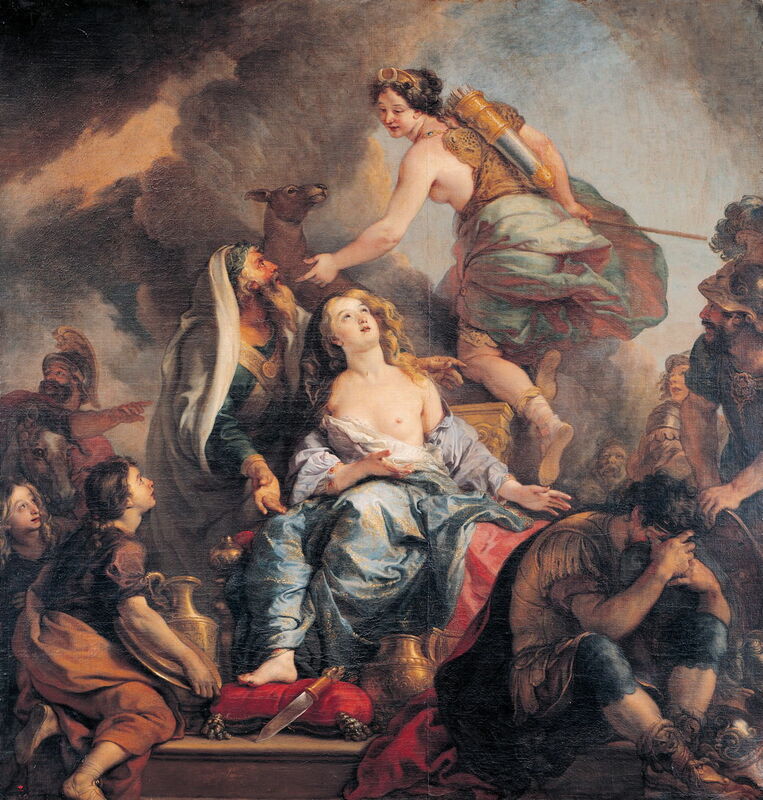 Charles de La Fosse (1636–1716), The Sacrifice of Iphigenia (1680), oil on canvas, 224 x 212 cm, Château de Versailles, Versailles, France. Wikimedia Commons. Ovid concluded Book 11 of his Metamorphoses with the story of Aesacus, who was transformed into a diver (bird). Book 12 opens by re-introducing Priam, Aesacus’ father and the king of Troy, and Aescaus’ brother Paris, whose abduction of Helen triggered the Greeks to launch ‘a thousand ships’ to start their war against Troy. The Greek fleet gathered at Aulis in Boeotia, where they made sacrifices to Jupiter in preparation for their departure. where they had just begun their sacrifice. the serpent buried in his greedy maw. curled crooked as a snake. and also calmed the anger of the sea. and gained the Phrygian shore. Thus it was Agamemnon’s sacrifice of his virgin daughter, Iphigenia, which propitiated Diana, and brought the calm needed by the fleet to sail against Troy. But Ovid is meticulous in leaving open whether the princess was really killed, or a deer acted as her proxy. This accommodated the many variants of this story, with their conflicting outcomes. Although Ovid’s first little story, of the snake eating the birds, doesn’t appear to have been painted much, if at all, the sacrifice of Iphigenia has remained a favourite with artists even into modern times. Domenichino (1581–1641), The Sacrifice of Iphigenia (c 1609), fresco, dimensions not known, Palazzo Giustiniani-Odescalchi, Viterbo, Italy. Wikimedia Commons. 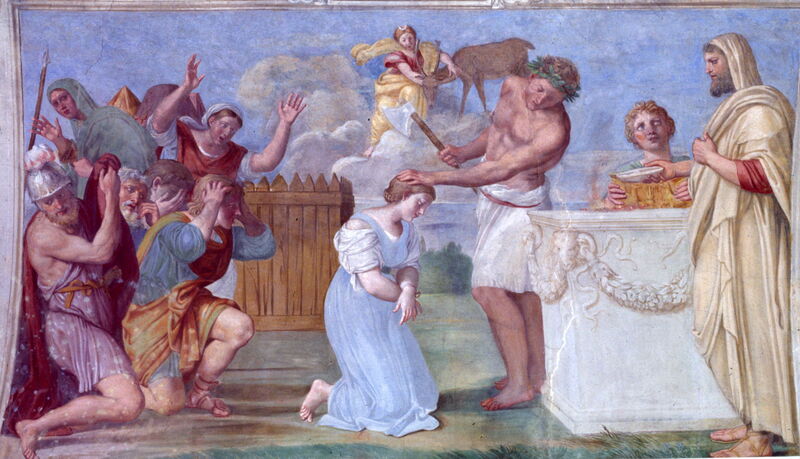 Among the earliest post-classical depictions is Domenichino’s fresco in Viterbo, Italy, of The Sacrifice of Iphigenia from about 1609. The princess kneels, her wrists bound together, as an axe is about to be swung at her neck. Onlookers at the left are distraught, as Agamemnon at the right watches impassively. But in the distance, Diana is leading a deer towards the altar, hopefully about to make the substitution. Charles de La Fosse’s The Sacrifice of Iphigenia (1680), now hanging in the Versailles palace, uses a powerful triangular composition to arrange the figures, with Diana at the top, telling Agamemnon to spare the young woman, to his evident surprise. His large sacrificial knife, dropped from Agamemnon’s right hand, rests by Iphigenia’s right foot. At the lower right, one of the Greek warriors, possibly Achilles himself, is still resigned to her sacrifice, but the warrior standing above is already smiling with relief. 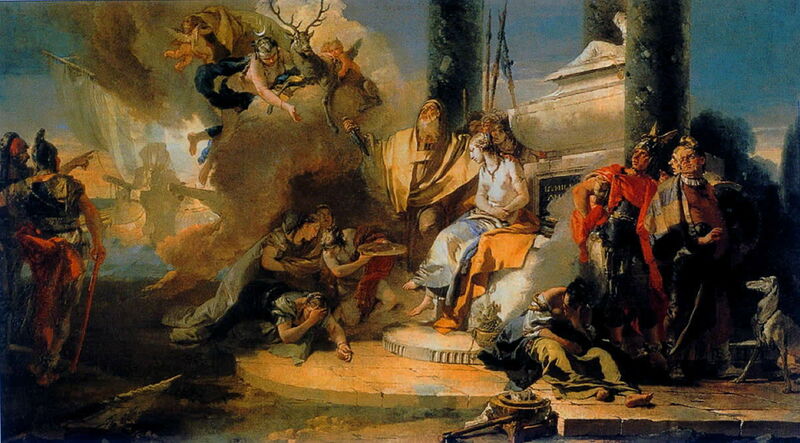 Giovanni Battista Tiepolo (1696–1770), The Sacrifice of Iphigenia (1770), oil on canvas, 65 × 112 cm, Private collection. Wikimedia Commons. Many other artists painted this story in the meantime, but to my eye the next outstanding work is Tiepolo’s The Sacrifice of Iphigenia almost a century later, in 1770. Iphigenia sits, almost spotlit with her pale flesh, as the priest, perhaps Agamemnon himself, looks up to the heavens, the knife held in his right hand. In a direct line with that hand, comes Diana in her characteristic divine cloud, ready with the deer. Below is a group of women, already holding the sacred bowl up to catch the sacrifical victim’s blood, and in the left distance are some of the thousand ships of the Greek fleet, waiting to sail. Jacques-Louis David (1748–1825), The Anger of Achilles (1819), oil on canvas, 105.3 x 145 cm, Kimbell Art Museum, Fort Worth, TX. Wikimedia Commons. My next choice is an unusual painting by Jacques-Louis David, who develops the story using other sources, and packs his figures close together to great effect, in The Anger of Achilles (1819). The twist here is that Iphigenia had already been promised as a bride to Achilles, by her father, and the announcement of her impending sacrifice throws Achilles into a rage. Achilles, at the left, reaches for his sword in an uncomfortable manoeuvre with his right arm. 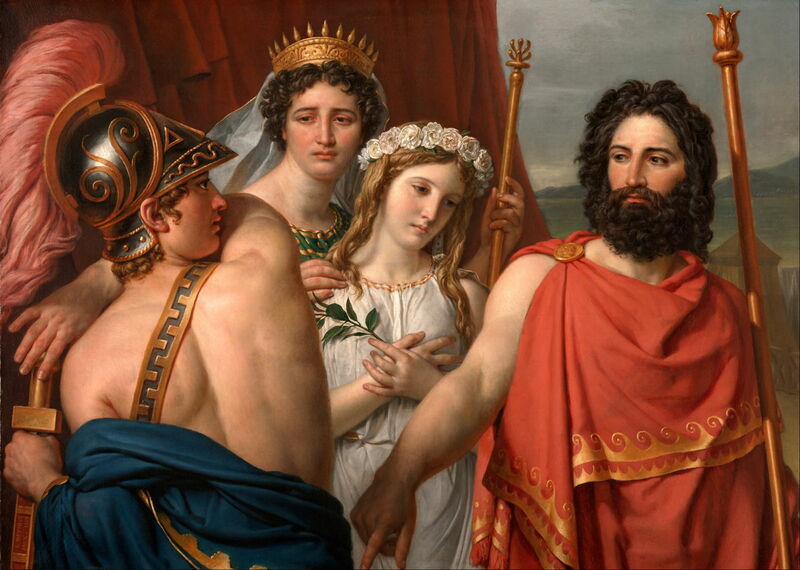 A rather masculine and tearful woman just to the right of him is Queen Clytemnestra, Iphigenia’s mother, and her right hand rests on Iphigenia’s shoulder. Iphigenia is dressed as a bride, and looks wistful, staring into the distance, her face empty of outward emotion. At the right, Agamemnon appears emotionless, but indicates firmly to Achilles for him to restrain his emotions. 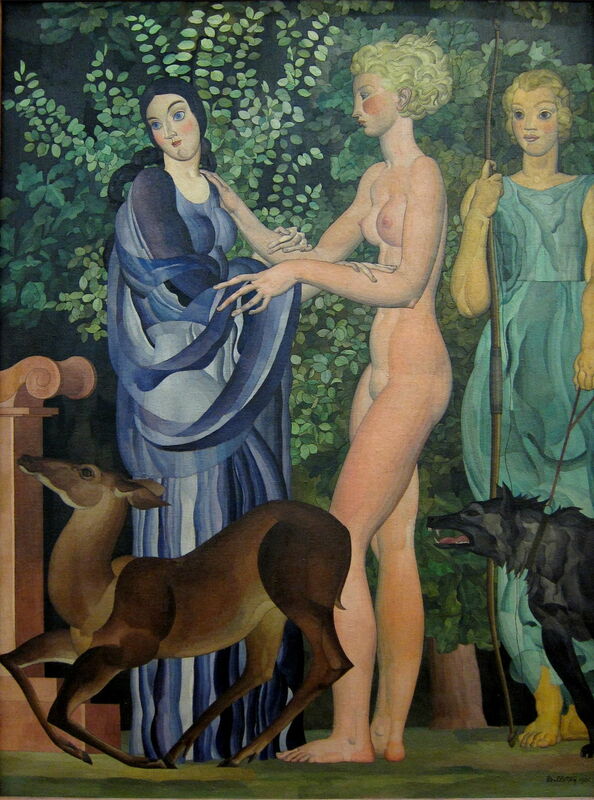 Louis Billotey (1883-1940), Iphigenia (1935), media and dimensions not known, Musée d’Art et d’Industrie de Roubaix, Roubaix, France. Wikimedia Commons. Over a century later, more modern artists continued to paint this story. Louis Billotey (1883-1940), who had won the Prix de Rome in 1907 but is now forgotten, painted his version of Iphigenia in 1935. Clytemnestra looks very distant at the left as she leads her daughter towards the sacrificial altar beside her. Diana, marked only by her bow and hunting dog, stands at the right, as the deer runs past. The story of Iphigenia’s sacrifice, no matter how it ends, is a glimpse back into a dark and distant past, at humans whose commitment to savage rituals overrode their humanity to one another, a story told with clarity in these paintings. Let’s hope that this isn’t also a vision of where we are already heading now. Posted in General, Language, Life, Painting and tagged Billotey, David, de la Fosse, Domenichino, Metamorphoses, myth, narrative, Ovid, painting, Tiepolo. Bookmark the permalink.